Former Delta State Governor Emmanuel Uduaghan has given the quest to advance the cause of peace and development in the Niger Delta as the reasons why he defected to the All Progressives Congress (APC). Uduaghan, who was governor on the platform of the Peoples Democratic Party (PDP), surfaced at the National caucus meeting of the APC at the Presidential Villa on Tuesday night to confirm speculations that he had joined the ruling party. He spoke to reporters after the meeting and issued a statement yesterday to shed more light on his move. He said “Politics is about interest. I’m from the Niger Delta and I managed a lot of crises in Niger Delta. “Sometimes I went to the creeks and engaged the boys, and my principle when I was managing the Niger Delta was that of engagement, and the current APC government has succeeded in managing the crisis they have met through engagement. “The President was seeing a lot of leaders from the Niger Delta while the Vice President went from state to state making a lot of engagements, and agreements were reached. “Nobody at that level had gone from state to state before in Nigeria, this was the first time and of course if that is happening, they need to be supported by those of us from the Niger Delta who are passionate about Niger Delta so that in moving forward we can have solutions to the crisis of Niger Delta. “If a new person comes he would start putting agreements up again and all that,’’ he said. 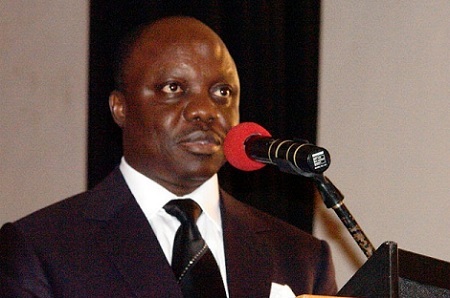 Uduaghan added: “Secondly in the area of infrastructure, this government has done very well. “Talking about my state, for the first time a rail line came to Delta, for the first time the gas city which we have been talking about, a committee has been officially inaugurated and for the first time we have human capital development projects, school feeding; a lot is happening in Niger Delta. “So for me, let me join the party to be able to effect changes because we cannot achieve anything by working from the outside in the Niger Delta. “Some of us have to join the APC train and many people are going to come with me so that we can achieve a lot more in the Niger Delta for the APC government. “Politics is about regional interest and I’m interested in the Niger Delta. In a statement yesterday, he said: “For over 12 years, I was deeply involved in the management of the issues of the region, first as Secretary to State Government, SSG, and then as Governor of Delta State for 8 years. Strategically, we had engagement as our major tool. “The toughest challenge for any leader in the Niger Delta since 1997 has been the issue of Peace and Security. He said “there has been an encouraging interest and activities by President Muhammadu Buhari to bring a permanent solution to the Niger Delta crisis. “The Buhari administration has embarked on various engagement processes that have led to agreements and brought hope to the people of the Niger Delta. In the last years, Mr. President has personally engaged several regional leaders and youths. Senior officials of his administration also engaged many Niger Delta leaders and youths. Very significant is that Mr. President mandated Vice President Prof Yemi Osinbajo to visit virtually all the oil producing states, engaging various stakeholders. This is unprecedented in the history of the region. Such engagement processes have brought some measure of peace in the Niger Delta. Things can only get better. “Indeed, once Mr. President was able to set his priorities pursuant to creating an environment for peace in the region, it became incumbent on every well-meaning Niger Deltan and Nigerian to assist the process of building an economically prosperous nation.